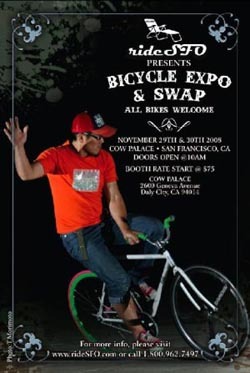 Be sure to mark your calendar for the upcoming inaugural San Francisco Bay Area Bicycle Expo and Swap, presented by rideSFO. The 2-day event takes place November 29th and 30th, at the Cow Palace. The Expo and Swap is about everything on human powered two wheel machines and related. Exhibitors include everyone from bike manufacturers, eco-friendly vendors, bike shops, teams, and advocacy groups. Booth spaces are available for all levels of participation, and the rates are staggered to maximize the value of your participation. The San Francisco Bay Area is a hot-spot of everything bike related. Whether you are a dealer with old inventory to move, a sales rep with a sample account that needs to get cleaned up, a manufacturer with a great line that needs an audience or a bike enthusiast that wants to find NOS Superbe Pro shift levers, the Bicycle Expo and Swap is the ticket. We are also currently scheduling various bike demos and shows highlighting a wide spectrum of the sport including a Kids demo course, BMX demos, trials, and even Pixie races. There will also be a massive raffle that will spread over 2 days. There will be something for everyone! Check out http://www.ridesfo.com for details.